The pillars, banisters, railings were caked with paint from 1920. 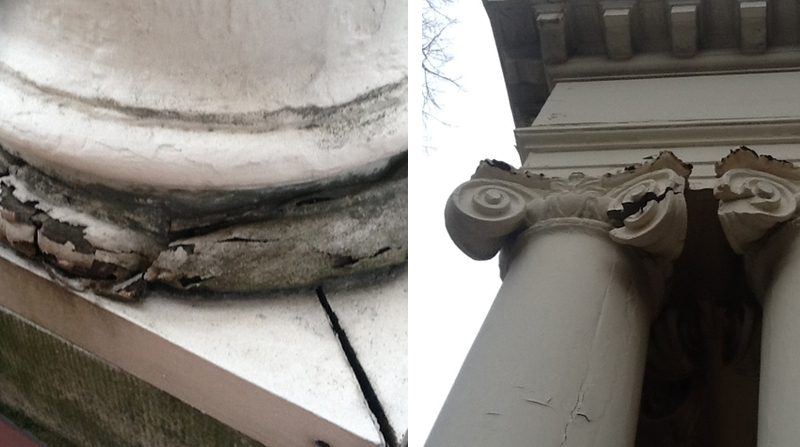 Significant signs of decay were evident and the pillars, made of 2 1/2 " wide shiplapped sections, were separating. The plaster ceiling had also failed. The wood elements were completely stripped using Peel-A-Way, neutralized and sanded smooth. A complete coat of a Clear Penetrating Epoxy Primer (CPEP), was applied to stabilize the wood and to ensure that subsequent epoxy fillers would bond. 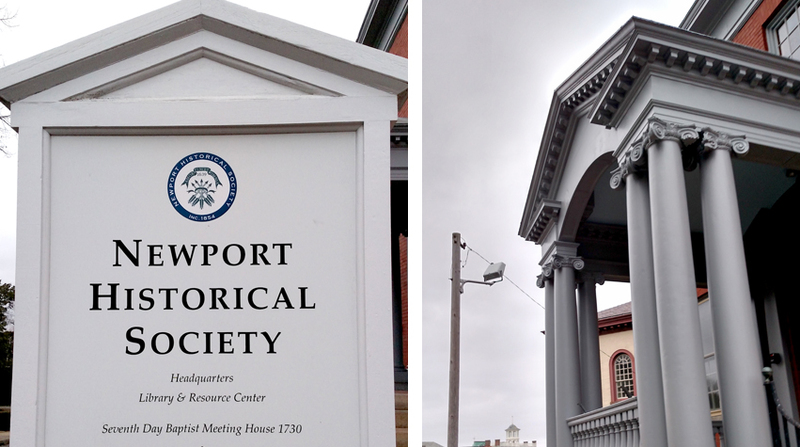 The railings were dismantled, repaired, reassembled and reattached. The broken and missing pieces of the capital detail were attached. The 2 1/2 " vertical sections were 'glued' together with 2 part structural epoxy adhesive. The sections were secured in using ratcheted straps until the adhesive cured. Once stable, the rotten sections were filled with wood 'dutchmen' or epoxy fillers. 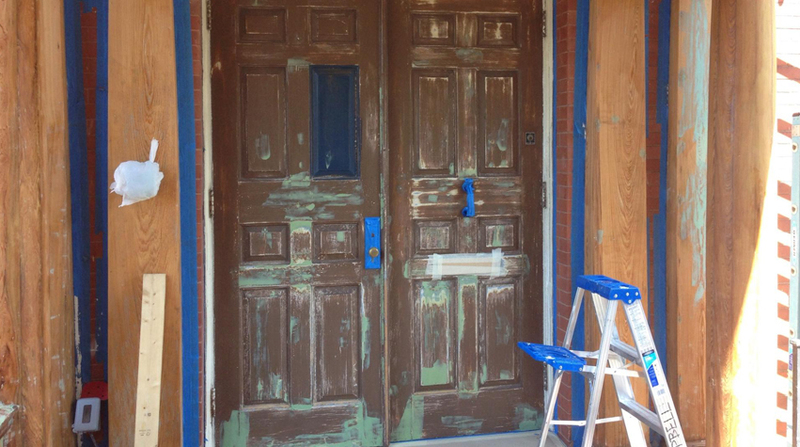 All the pieces of the entryway were sanded smooth, and treated with a second application of CPEP epoxy primer. Two coats of conventional oil based primer were applied, filling, sanding and caulking between coats. Two coats of waterborne/alkyd finish paint were applied. The loose and compromised plaster was removed from the ceiling and the sound plaster treated with a concrete bonding agent. 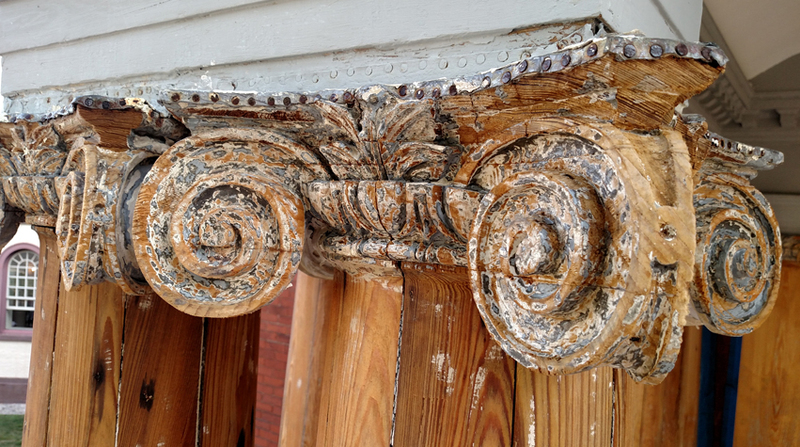 A mix of portland cement and sand was applied and sponged to the achieve the original finish. A cement-based primer and 2 coats of acrylic paint were applied. The putty had failed in every window. 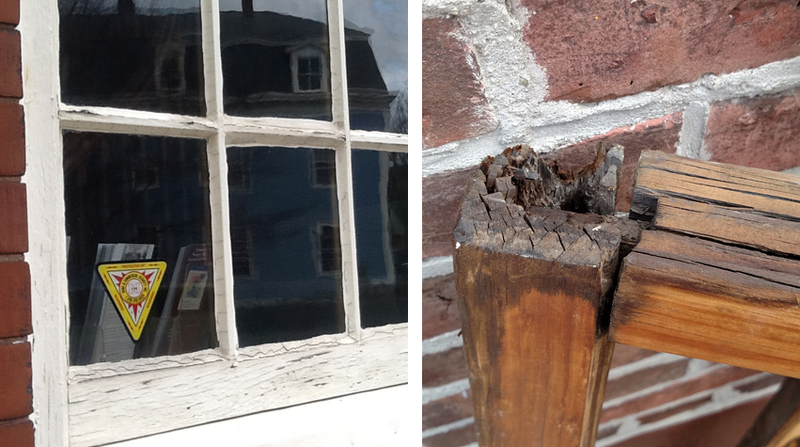 Some of the sash had significant areas of rot, missing sash cord, missing locks. The parting strips were warped, broken or missing. Many of the sills were rotten. 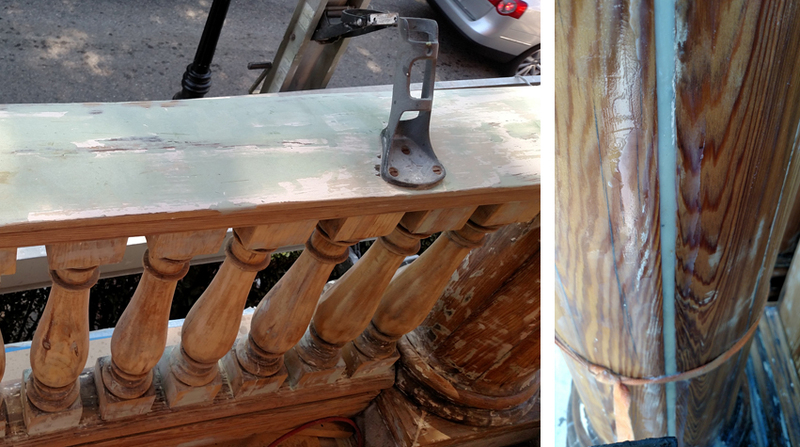 The frames/sills were scraped to bare wood, treated with CPEP, repaired, primed, and painted. The window sash were removed and taken to the workshop, steam stipped to remove glass, putty and paint. 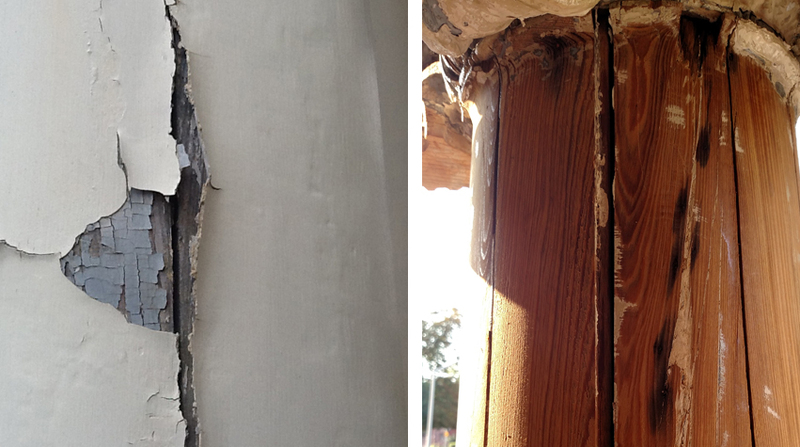 The bare wood was treated with a complete coat of CPEP, repaired and filled with 2 parts structural epoxy. The original glass was installed and puttied. The sash were then primed and painted with waterborne/alkyd paint. New parting strips were made using mahogany. The sash were reinstalled with new rope and solid brass locks and fingerlifts.